Many pet-lovers are becoming aware of the benefits that artificial grass has to offer. Even world-renowned pet psychologist and dog trainer, Cesar Millan chooses EasyTurf synthetic turf over any other option for his Dog Psychology Center. Being a pet owner and a homeowner can bring with it a unique set of challenges. Making sure your outdoor living spaces look their best can be difficult especially if you’re also trying to ensure your furry friend is getting all the outdoor playtime that they need. One of the things that pet owners love about EasyTurf artificial pet grass is that the texture is luxuriously soft, yet highly durable. The fibers used to make our artificial turf are made to perfectly match the look and feel of live turf. For pets and children, this can make a huge difference by giving them a place to play that is soft and cushioned. Torn blades aren’t a problem when you place your trust with JNR Home Improvements and EasyTurf! Pet owners know that they can count on the durability of EasyTurf to look good through all wear and activity. Big dogs and tiny pups alike need exercise throughout the day to keep healthy and happy. EasyTurf pet-friendly turf is great for any pet owner that doesn’t like a mess. Thanks to the 100% permeable proprietary backing on our artificial grass, keeping your lawn looking its best is as easy as washing your hands! The proprietary backing allows liquids to flow through the base and into the earth below without any trouble, while also preventing muddy backflow. In the winter when it rains more often, this ensures that you won’t have to deal with muddy paws tracking dirt through your home. Whereas pet waste can leave discolored brown patches on live grass, that isn’t the case with EasyTurf artificial grass. This quality turf keeps its color no matter what, and because you don’t have to worry about mud, spraying away pet waste is a cinch! EasyTurf artificial grass is made out of antimicrobial materials that help to keep bugs from setting up shop outside your home. When you have a dog or a cat that likes to play outdoors, keeping bugs away is a necessity! Parasites like ear mites and fleas require special medicines to get rid of and can cause a lot of stress for your furry friend. Making your outdoor living spaces less hospitable to these nuisances can profoundly improve spring and summer for both you and your pets. Pet-friendly artificial grass is a massive boon for home-owning pet parents. Not only does it improve the curb appeal of a home, but it also keeps its great looks with very minimal care! Dogs can put your outdoor spaces through the wringer: digging, running, and pet waste can all wreak havoc on live grass. Switching to artificial dog turf will eliminate many of your outdoor chores, while visibly preserving the beauty of your yard and making it more enjoyable for you and your pup. JNR Home Improvements is committed to serving the families and homeowners of the Antelope Valley and Santa Clarita areas. We believe that you and your loved ones deserve a backyard that can provide for all of your needs while cutting down on maintenance needs and water waste. We are proud to be the exclusive dealer and installer of EasyTurf in both Santa Clarita and the Antelope Valley. Through this partnership, we are able to deliver quality products to our neighbors at affordable rates. JNR Home Improvements is the leader in low-maintenance landscaping. With a focus on customer satisfaction, we aim to deliver the very best on each project. Selected by readers of the AV Press as the best landscaping company of 2018 and featured on Enterprise magazine’s Enterprise360™ List, we believe that our commitment shines through in all of our work. We offer exclusive products and designs in artificial grass, xeriscape, aluminum patio covers, concrete work, and more! Our skilled field crew is equipped to handle every aspect of a project. Call or email us TODAY to learn more about we can do for you! Right now, while we’re still feeling the chill of winter wind, it’s hard to imagine that the summer heat will be here in full force in just a matter of weeks. Though it seems distant, now is the best time to start working on prepping your home for the heat, and one of the top ways to do that is to install a patio cover in your backyard. Patio covers can improve your home for this summer and all the summers to come by providing visual appeal, shade, and comfort to you and your family. The shade provided by one of our aluminum patio covers is a stark improvement over the shade of a more typical wooden cover. Even in the height of summer, an insulated aluminum patio cover can provide shade that is significantly cooler than temperatures in the sun. The shade made by an aluminum patio cover will completely change your late spring and summertime experience. The laminated foam core of our patio covers block the sun’s heat from penetrating through to the space below. Wooden covers aren’t able to block heat, allowing it to radiate down to the space below. For cool comfortable shade in the high desert, an insulated patio cover can make all the difference! Because of the cooling effect of an aluminum patio cover, you’ll notice that you need to run your AC units less frequently over the year. From spring and all the way up into fall, you’ll be able to enjoy cooler temperatures with a lower energy bill. Our insulated patio covers are so effective in reducing heat that they have earned an Energy Star rating! In addition to the natural cooling effect of our patio covers, they provide the perfect space to install energy-saving solar panels at your home. Solar panel patio covers can help you eliminate your energy costs, without the trouble associated with installing panels to your roof. The shaded space provided by a patio cover or a pergola can totally improve any outdoor get-togethers that you host. Barbeques, playdates, and family reunions, are so much nicer when you and your friends have a designated spot to relax and hang out. You and your loved ones will love the chance to sit in the shade to eat, chat, or just take a break from enjoying the rest of your backyard. At a big get together for a holiday or birthday, there’s no better place than in the relaxing shade of a patio cover. Beyond the ways that a patio cover can enhance the enjoyment of your outdoor spaces, they are also highly customizable. We offer you the chance to select a patio cover that is wholly suited to the needs of your home, from colors and design to lighting installation. Lattice patio covers offer free air flow with a smattering of sunlight, while solid covers give you total shade coverage, and free-standing pergolas can be installed anywhere in your yard that you want to add a bit of shade. Our experts are ready to help you find the best option for you! Additionally, a quality insulated patio cover or awning can improve the value and appeal of your home. If you choose to sell or rent out your home in the future, an effective patio cover can help you get more offers. A quality patio cover is truly a valuable investment into your home. Installing a patio cover is a great, lasting way for you to take your backyard back, and JNR Home Improvements is here to help you do that. Our knowledgeable crew members will help you to find and design something that really works for you. We are proud to bring our expertise to homeowners in the Antelope Valley and Santa Clarita areas. JNR Home Improvements is your outdoor living space expert. Specializing in energy efficient, low maintenance outdoor living spaces, we bring you options in patio covers, artificial grass, xeriscape, and concrete. Readers of the AV Press have recognized us as the best landscaping company of 2018, and we were also featured in Enterprise magazine’s Enterprise360™ List of best companies in America. Call or email us TODAY to learn more about what we can do for you! As we get ready to welcome spring, homeowners have to start thinking about what they have to do to get their outdoor spaces ready for the new season. Having artificial turf makes the seasonal transition much easier, fully eliminating many of the chores and worries that accompany live grass. It’s amazing how many things about spring are better when you have synthetic grass at your home! Natural lawns require a lot of attention following the winter months. From the decay of autumn leaves to slushy puddles brought by winter rain, live turf needs you to put in no small amount of Spring Cleaning. Reseeding and fertilizing your lawn takes time and effort--to say nothing about that smell!--when you could just jump straight to enjoying the warmer weather. Artificial grass looks great all year long, with none of the maintenance work that a live lawn requires. Once spring arrives you’re able to go straight to enjoying your outdoor living spaces. As it gets warmer, we’ll start to see less rain. For homeowners with sod, they’ll have to water their outdoor spaces almost every day, leading to a massive spike in their water bills. Choosing water-efficient landscaping that features artificial grass can save you a ton of money over the year. 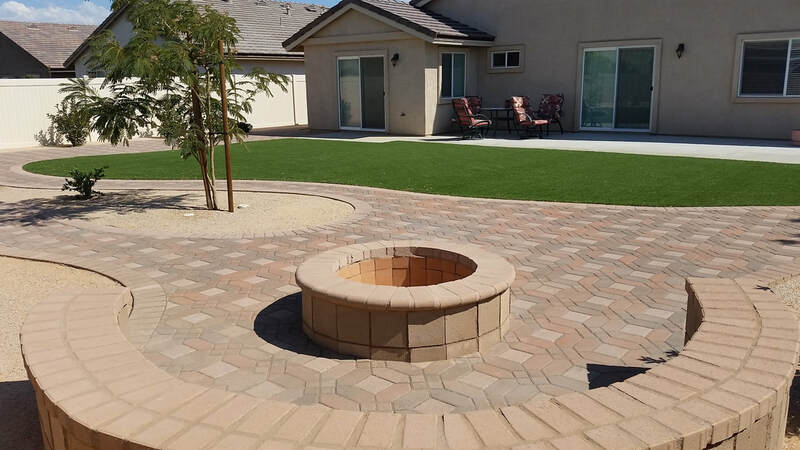 Even with live accent plants in your yard, whether flowers or native desert plants, artificial grass provides homeowners with a lot of savings in both cost of water and in other maintenance requirements. One of the biggest upsides having a synthetic lawn, especially as temperatures start to warm, is the absence of bugs. The fibers that make up EasyTurf artificial grass are antimicrobial, meaning that they banish bugs and combat germs, helping keep new pests from setting up residence in your yard. No one wants ants at their barbeque, to say nothing about other pests like mosquitoes, gnats, and flies. These are nuisances that like to your outdoor spaces into their homes, either in the grass or in puddles and waste that result from having live turf. By making your outdoor spaces inhospitable to creepy crawlies, you’re able to enjoy spring a bit more. The 100% permeable, proprietary backing of EasyTurf artificial grass means that puddles won’t ruin your yard. Regardless of whether the water is from rain or playing with a sprinkler or hose, water that hits your artificial grass will flow through easily to the ground below. Without the puddles, pets and kids are able to fully enjoy the outdoors. There will be no worry of muddy paws or dirty clothes because our water efficient landscaping prevents muddy backflow as well as grass stains. Our low-maintenance landscaping is designed with families in mind. This artificial grass offers a gentle, life-like feel with a highly durable design. Families are able to enjoy their outdoor living spaces to its fullest extent because it offers a great play space that can hold up to even the roughest and tumble of games. High energy pets can’t put a dent into our low-maintenance landscaping. Even big family get-togethers with all of the cousins won’t be able to stain or damage your turf. Any spills are quickly and easily washed away, while the design of our turf blades is highly resistant to wear and tear. Torn blades and discoloration are a thing of the past, allowing you to enjoy your yard for many years to come. At JNR Home Improvements, we offer top quality Outdoor Living Spaces. We specialize in artificial turf, desertscape, and aluminum patio covers. If you are hoping to make the switch from live grass turf to more drought-tolerant landscaping, we are here to help you find the best option for your home! Chosen as the best landscaping company of 2018 by readers of the AV Press and featured on Enterprise magazine’s Enterprise360™ list, JNR Home Improvements proudly brings reliable, low-maintenance landscaping to homeowners in the Antelope Valley and Santa Clarita areas. With plenty of options and affordable financing, we are committed to giving you the yard that you want at the right price! Call or email us NOW to learn more about what we can offer you!